Sometimes I get lazy and don’t want to cook. It’s true. When just fits of laziness strike, I usually try to figure out something simple, delicious, and nutritious to make that doesn’t require a lot of time and effort and also uses whatever I happen to have in the fridge and pantry. This is one such dish. 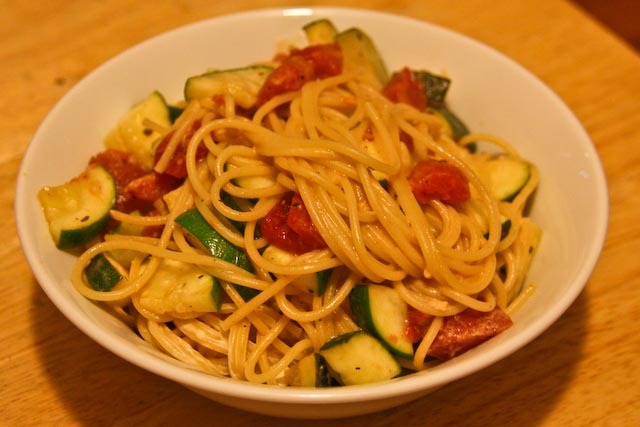 The other night I was craving pasta, but wanted to make it somewhat healthy, so I opted to cook a vegetarian pasta with tomatoes, zucchini, garlic, and goat cheese. It turned out pretty scrumptious, so I thought I’d share it with you. 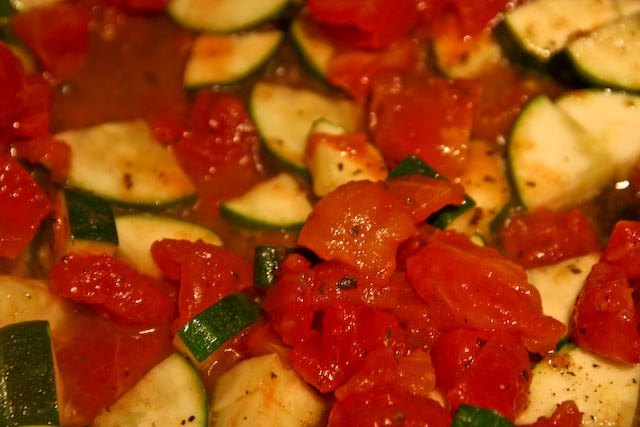 Just a little olive oil, garlic, zucchini, stewed diced tomatoes, salt and pepper go a long, long way. 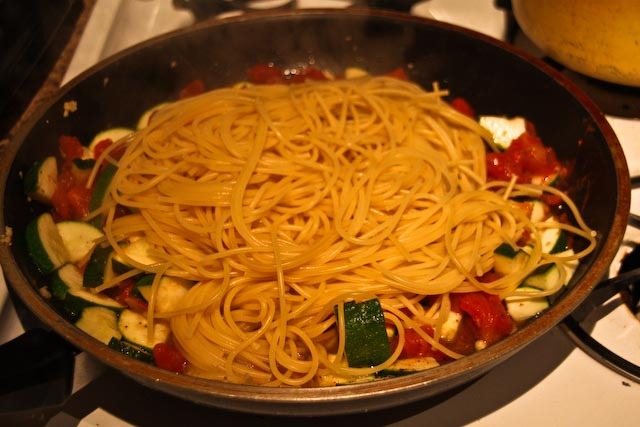 One of the best tricks I’ve learned for making a great pasta – where the sauce and pasta are really married together – is to mix the pasta directly into the sauce pan, add a little starchy pasta water, and blend everything together with a bit of melted cheese (Parmesan is a great choice, but goat cheese works well too). Mmm, mmm! Heat olive oil in a saute pan over medium heat, and add garlic. Cook for a few minutes, but don’t let it brown. 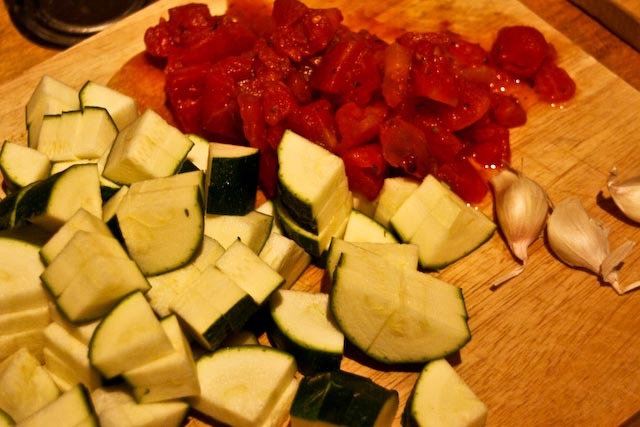 Add zucchini and cook for a few minutes. Add tomatoes, salt and pepper. Cook for a few more minutes, stirring often. Add pasta water, cook and stir for a few more minutes, then add strained pasta and goat cheese. 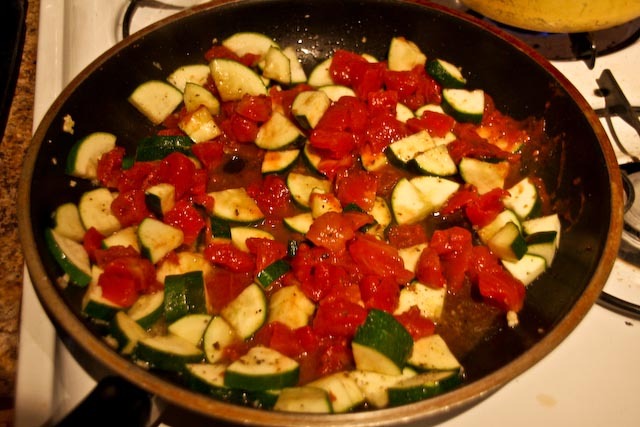 Blend everything well in the saute pan, and serve warm. Top with additional goat cheese or Parmesan cheese, if desired. i did something similar to this with balsamic and it was fabulous.